Wouldn’t it be nice if there was an air compressor that plugs into one of those outlets? There are many battery-powered air pumps on the market that charge via USB. The CYCPLUS A2 portable air compressor is just one. It’s a mini tire inflator for motorcycle, bicycle and even car tires. … annnd (saving the best for last) a pressure pre-set that stops the compressor at any desired pressure between 3 and 150 PSI. Set it and forget it. Walk away and do something else while it’s filling your tire. Also, if you don’t like PSI, there are three other units (BAR, KPA, Kg/cm3). I’ve yet to find any reasons to bash the CYCPLUS A2, though some reviewers claim the battery doesn’t last very long. We’ll just have to wait and see about that. Other than those reviews, this machine is like a Nighthawk in that it does everything it’s supposed to fairly well. Maybe it’s not the fastest compressor but it’s fast enough for me. Maybe a 2.5-hour charge isn’t the greatest but I’m not complainin’. It’s far better than an overheating compressor or CO2 canisters. BONUS: Comes with a drink holder-style, bike frame mounting bracket and various inflation tools. The Slime can’t be operated beyond four minutes increments due to heat build-up, then needing five-minutes to cool-down. The CYCPLUS A2 gets a little hot during use but the instructions say to keep pumping. Adding about 20 PSI to my wife’s car tire, it pumped for roughly ten minutes and stopped when it hit the pressure pre-set. This could’ve taken fifteen minutes for all I care. I was off doing something else while it ran. It’s considerably accurate, too. After topping off the car tire, a check with my digital tire gauge showed it was within 1 PSI. My CB1100 calls for two different pressures: 39 PSI up front and 43 in the rear. It takes about two seconds to change the pre-set (set it and forget it, indeed). Now I have no excuse not to check my tires’ pressure before every ride. In fact, I look forward to it. Fellow rider and guest author Don Birren has posted a total of 1 article. I was a cyclist before becoming a motorcyclist. 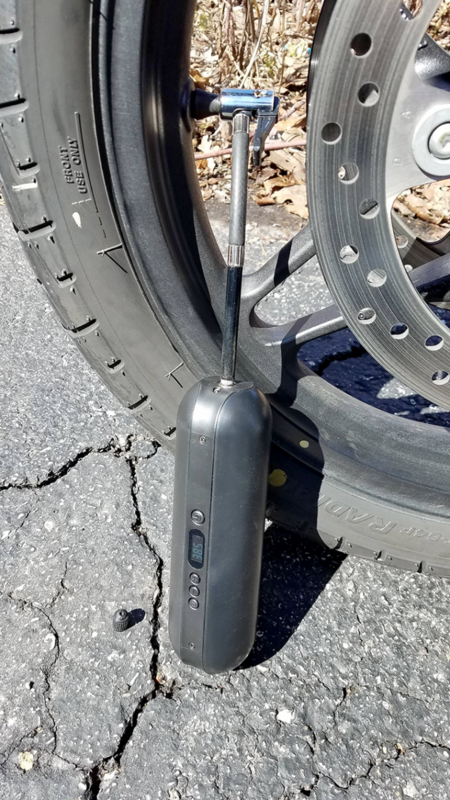 Bike pump sits next to my front wheel (when parked in the garage) and a tire gauge is clipped to it. Between five and fifteen pumps will top a tire off, and while it’s quick enough, I still tend to do that bit of prep the night or hour before my gear’s on and I’m itching to go. Obviously the bike pump is of little use on the road, so I’m glad to know about this handy piece of kit for when I want one.